Anyone who enjoys making and wearing their own beautiful jewelry will not want to miss this new twist on beaded jewelry. Cabochons are round or oval pieces of precious or semi-precious stone (or acrylic) which are domed on top and flat on the back. When surrounded by glass beads, stone beads and other natural materials, they make gorgeous pieces of jewelry that everyone will want to create and own. 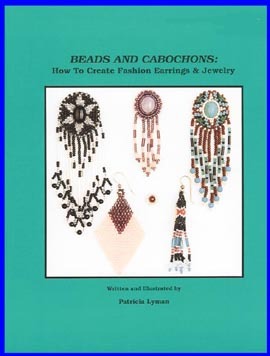 First time author Patti Lyman presents step-by-step instructions on making cabochon earrings, necklaces, barrettes, brooches and bolos. This very versatile book also includes new and traditional Brick Stitch designs, Peyote Stitch instructions which one reader described as "the only ones she had actually been able to follow without seeing it done", Beaded Crystal Caps and an Applique Design for a Rosebud Barrette or Brooch. Color schemes are suggested for each item, along with alternatives, but readers are encouraged to be creative with their own color schemes and designs. The book begins with a section describing the Materials used and General Instructions that include Knots and Thread, Beading Tips, making Dangles, working with Porcupine Quills, and Mounting Beadwork on Findings. Step-by-step instructions for making Cabochon Designs describe the basic technique used. This includes Getting Started, Beading the Rosette, Mounting Earrings, Mounting Other Jewelry, Leather Backing, and Edging the Beadwork. Projects using this technique include Small Cabochon Button Earrings, Star Rosette Earrings, Star Rosette Brooch, Iridescent Earrings and Necklace, and Starburst Rosette Earrings and Bolo Tie. The same Overlaid or Applique beading stitch used around the cabochons is also used to outline and fill the interior of a design on material in the Rosebud Barrette or Brooch project. Simple, clear Peyote Stitch Instructions are given along with specific projects for Peyote Barrel Top Earrings and Beaded Crystal Caps that can be made into earrings or a necklace, or a set of both. This method prevents any metal from touching the crystals. Basic Brick Stitch Instructions are followed by projects for Brick Stitch Diamond Earrings, Versatile Triangles with Rondelles, and Multicolored Quill and Stone Bead Earrings. This is truly a book that every crafter will enjoy and want to own!